Update, January 17 2017. I need to clarify a couple of things about this experiment. 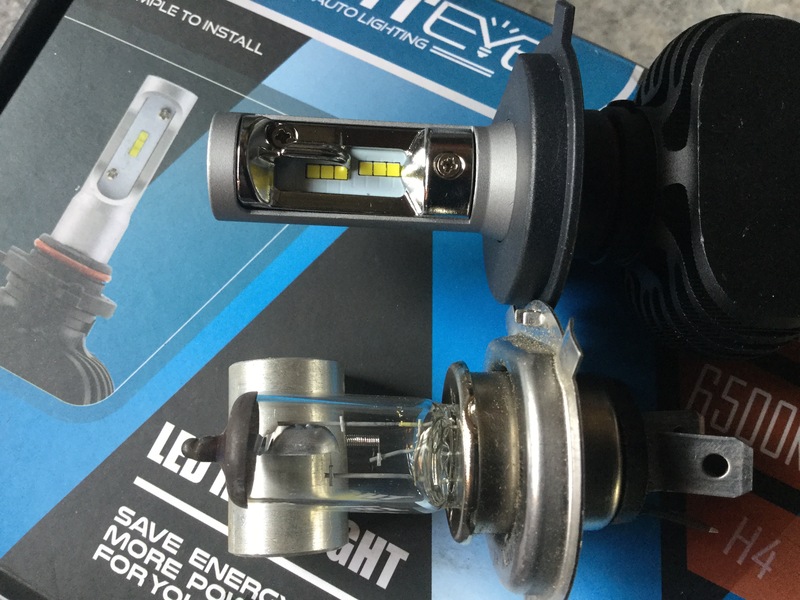 First, the led bulbs were tried in my Hella 7″ e-code (e 4 to be precise) lamps. 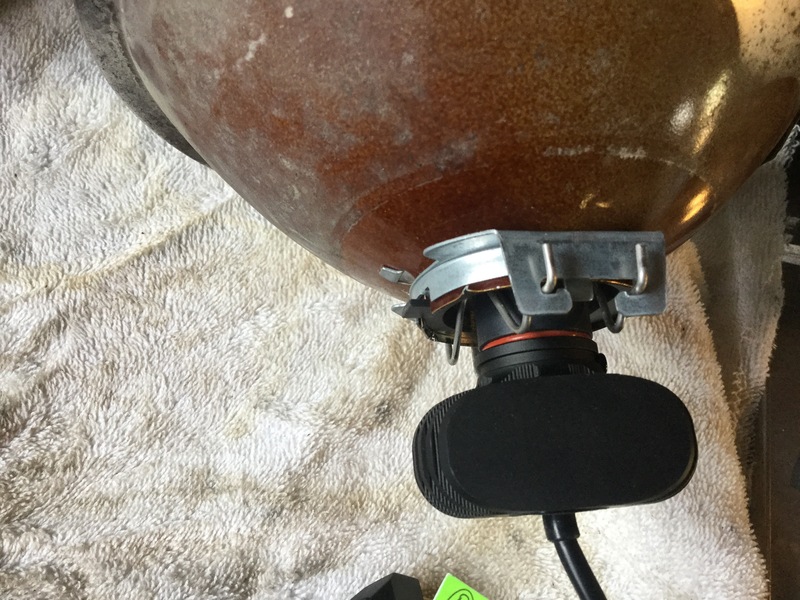 The lamps are in good shape, no hazing on the lens and the reflectors are in great shape. They do however have stick on impact protection film applied. 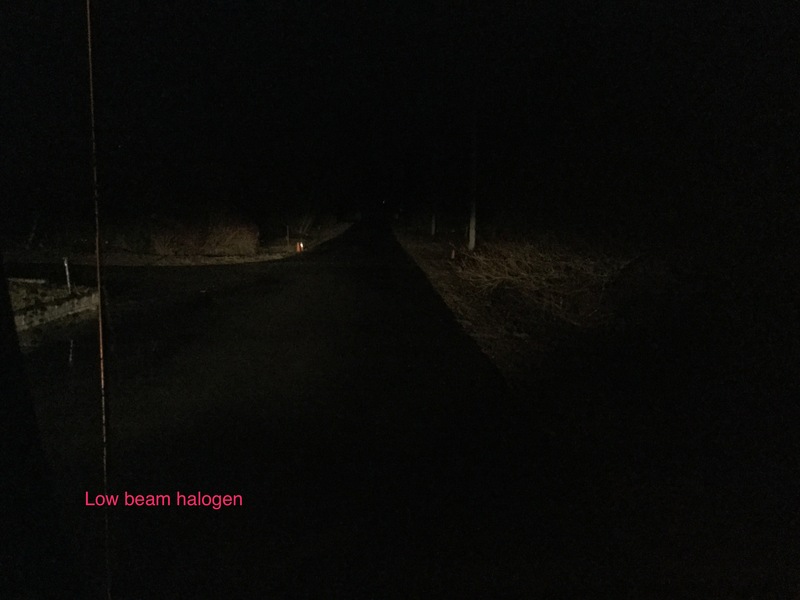 The beam pattern, specifically the low beam cut off, appears to be very similar whether it’s led or halogen bulb. But yes I should document that, and if I can find a suitable wall close by I will. 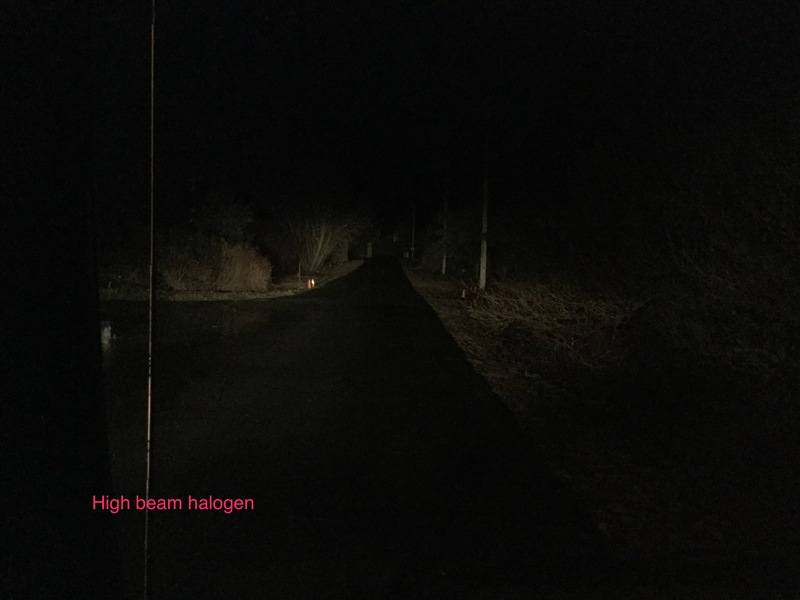 Second, I am having a hard time quantifying or even describing clearly my perception that the high beam distance projection seems less with the led bulb. I think you’ll just have to take my opinion on this for what it’s worth. Oh and one more thing. The radio interference from these bulbs annoys me greatly. I have a fair bit of pwm regulated led interior lighting and have not noticed any interference from those. I have noticed a little interference from my “built into the bumper ” led back up lights, that should have been a warning I guess. Hindsight is so very very clear isn’t it? The interference effect now cautions me with another pwm project I have on the bench. I will test it in the van before going any further. Ok, before you say anything, I know. 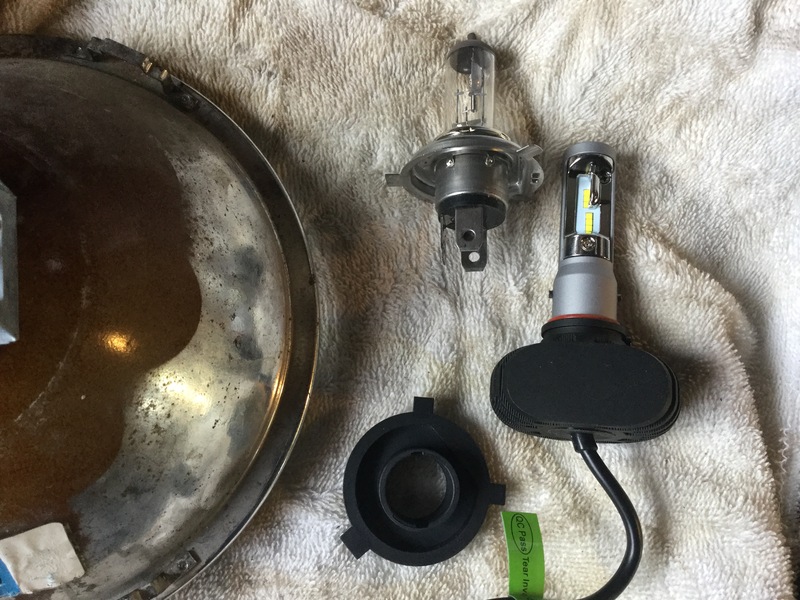 I know the arguments about replacing the halogen bulb in H4 lamps with an led unit. And I agree with them. But, I had to try this. What got me trying was reading a positive report about a Philips led bulb replacement. What was new to me with the Philips was the location of the led elements on the bulb. 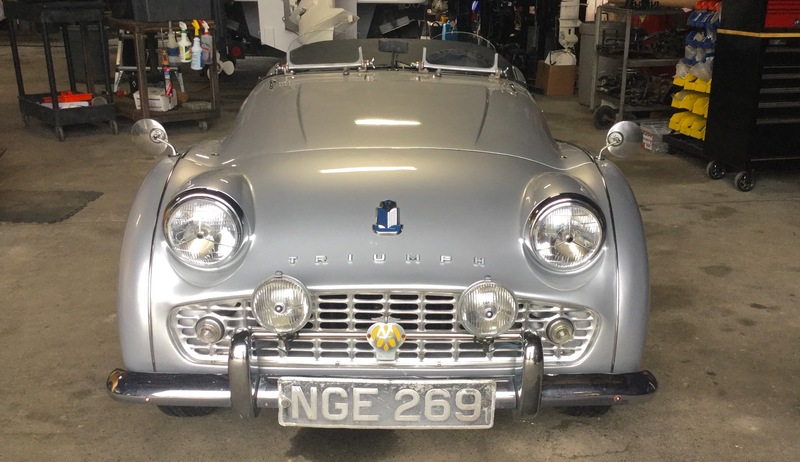 It mimicked the location of the high and low filaments of the halogen bulb and also had the little shield on the low beam elements similar to what is on the halogen bulb. I think the Philips led units, and forgive me for not linking to a source, are around Ca$150 a pair. A bit steep for me but then I found what look to be close copies listed on Banggood. And, unlike other led drop-ins, these are passively cooled via a finned heat sink. Others have fans in the heat sink and for some reason I didn’t like that. So for around Ca$45 bucks I bought a pair, and they arrived on the slow boat last week. You can see the led element layout in that pic. Just to be clear they are double sided. And you can see the little shield or shade over the distal elements. Just to be pedantic, here it is compared with a halogen bulb. I didn’t try to do any measurements comparing the led element positions with the halogen filaments but you can see they are approximately in the same location. Another view of the led bulb. It doesn’t look like those little shields on each side line up perfectly does it? Installating in the lamp is a breeze. 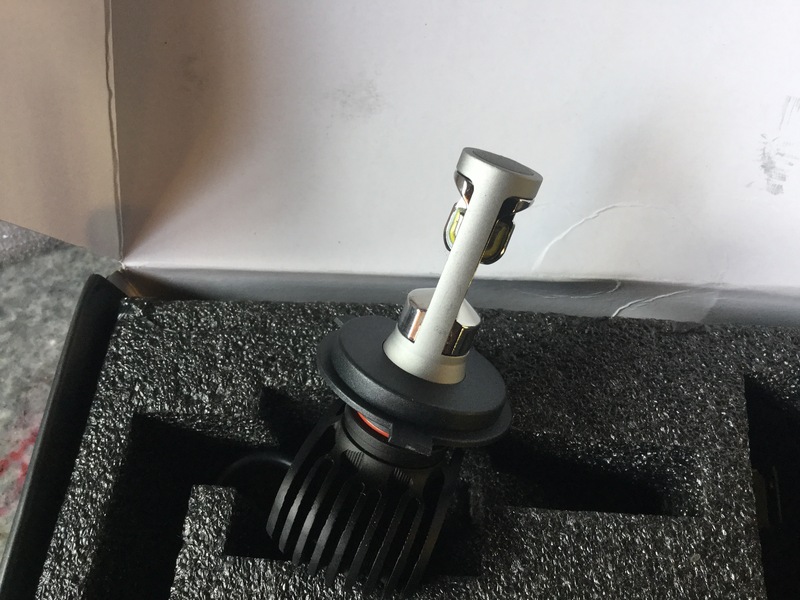 The three prong adapter ring is a twist fit on the bulb. 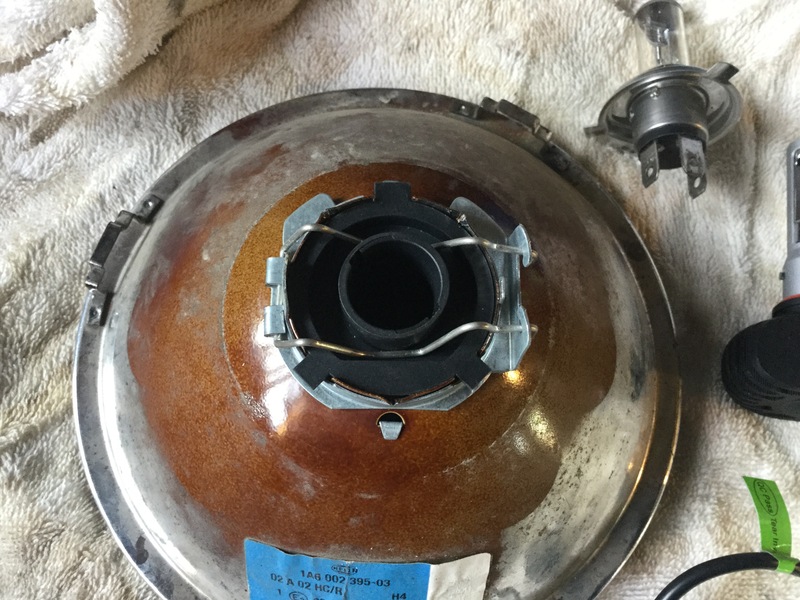 You remove that and install the ring on the lamp and clip down the wire bail as you would with normal bulb. This pic shows the led bulb with the adapter ring removed. And the bulb goes in with a push and twist lock. It didn’t seem like a very tight twist and lock, not pleased with that. Oh, and the bulb can be inserted in two orientations, 180 degrees apart. 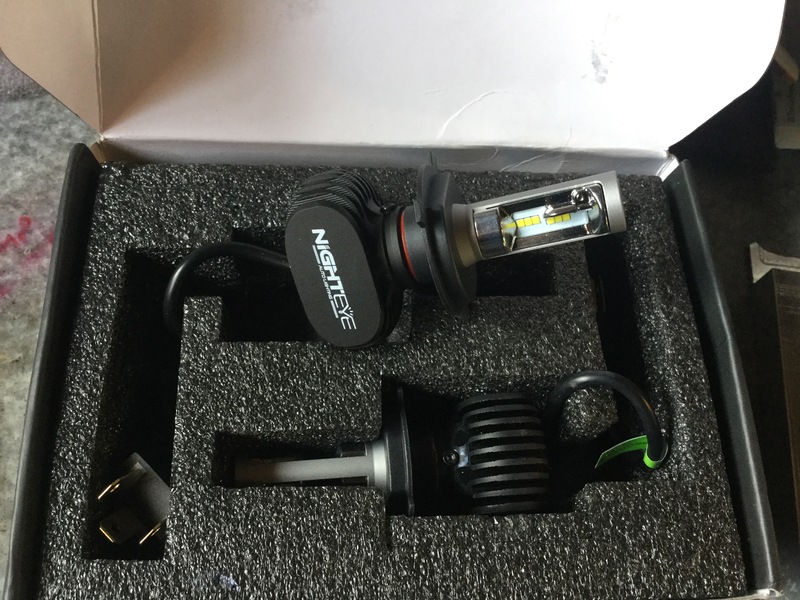 You have to be careful to get it right, to have the little shields/shades in the same orientation as the original halogen. And there you go, lamp goes back into the van. I did this during daylight so a comparison picture ain’t that special. Mind you, taking any kind of picture of lighting is more or less folly. The pictures never seem to tell the same story your eyes do. But I did take a picture with one lamp having the led bulb and the other lamp with a 80/100 halogen. Both are on low beam, cam you feel the difference? Yup, driver’s side has the led. Seems pretty bright eh? And with all high K value leds it makes incandescent lights appear more amber. And what about when it was dark? Didn’t take any shots of the lights but I did do some driving. The low beams are nice, like the whiter light on the pavement. But the high beams are not so pleasing. As an aside, I bet most of you know this already, the colour value of the light seems to make a big difference in how you perceive the light. On high beams I was underwhelmed by the projection of the light. 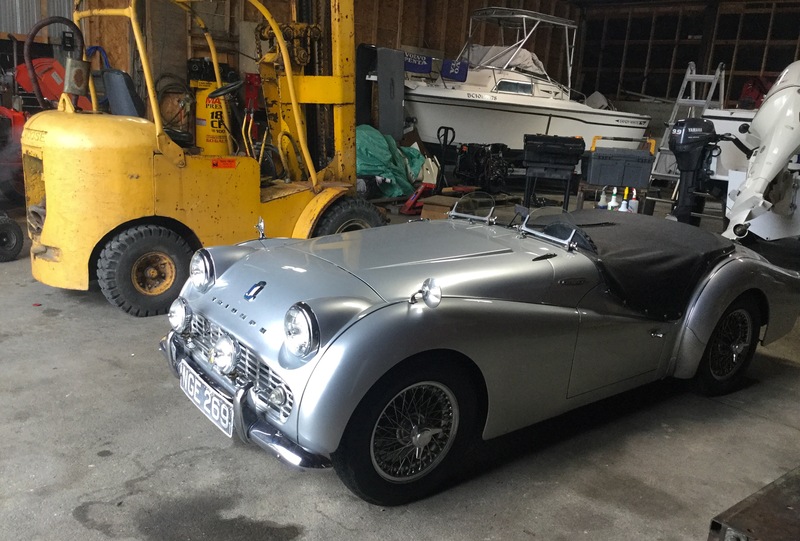 It’s hard to put in words, and I honestly can’t explain the effect, but the high beams just don’t seem as strong as the 100W halogens. Well, yes, I am comparing them to 100W so I have to add a grain of salt. What is very noticeable is how bright the reflective roadside signs appear under the led light. Once I got onto truly dark roads the lights appeared to project further. Boy this is hard to explain, all so subjective, but cut me some slack I am trying. Tonight I lined the van up beside my friends Ducato van. Stock lights on that van and it was raining. Once again I’ll say pictures are really not very good at reproducing the actual lighting as I perceived it but here we go. 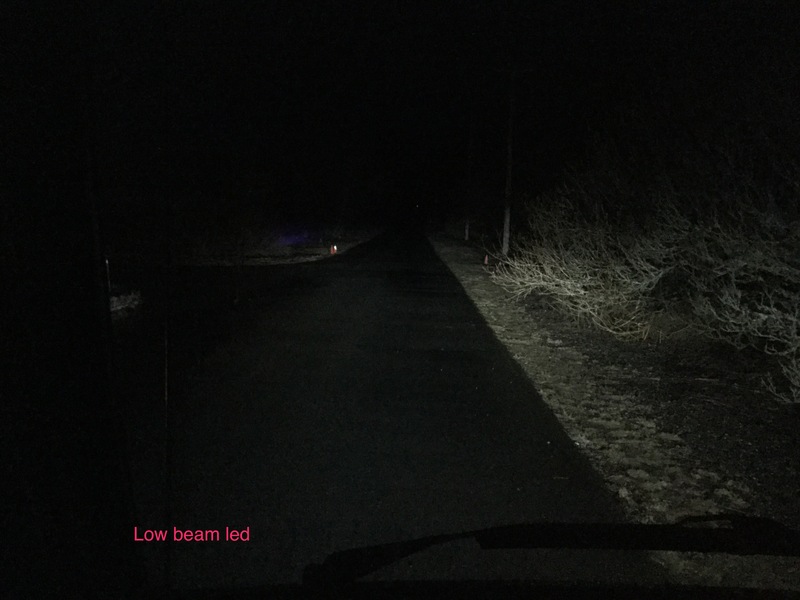 First pic is my van with led lights, low beam ( my van is on the right hand side of the driveway in all the pics so there will be a light bias towards the right of the driveway due to the low and right nature of the lamp aiming). And high beams from the Ducato. 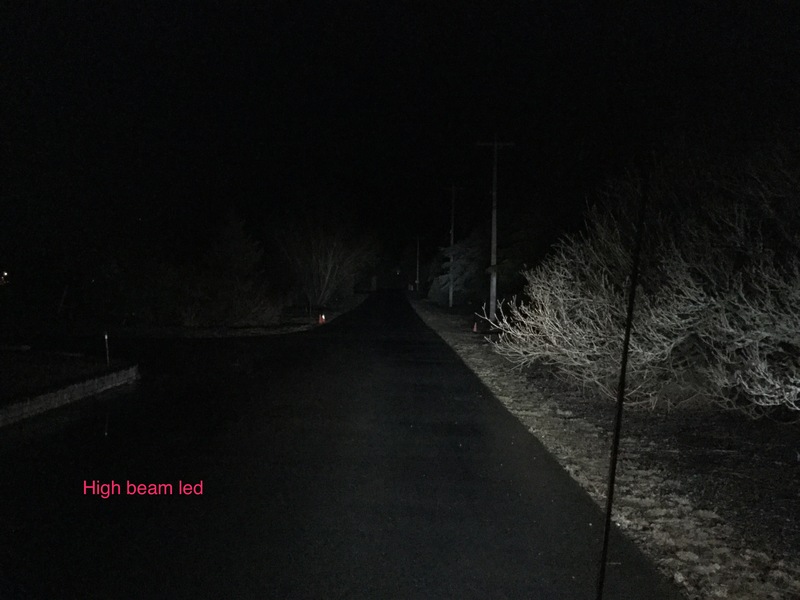 Even though the pics don’t give a true representation of the lights, I think they do show that on high beams the halogens seem to shine further , or at least reflect back from a further distance. But then again it’s not super distinct. 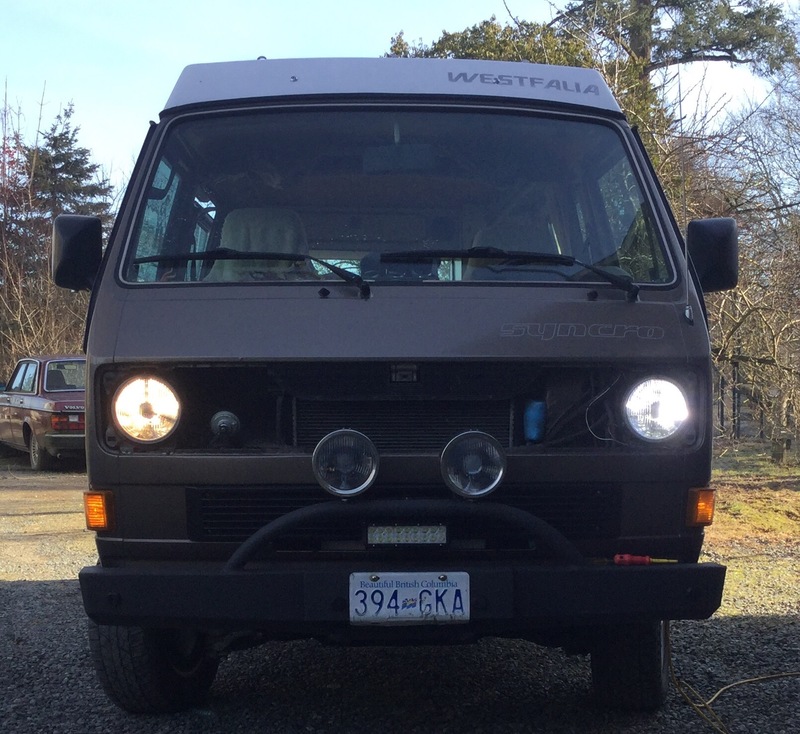 Oh, one thing to note, the sharp cut off on the E code lamps on my van is still maintained with the led bulbs. But here is the deal breaker. And it shouldn’t have been as much if a surprise as it was. The damn leds create radio interference. It’s only really bad on weak signals, but it’s very annoying. I bet the Philips bulbs do not do this, I bet it’s a result of the cheap price of the units I bought. radio interference, long range reach in high beams, no heat on front of lamp to melt ice and snow.